Each fighting in the arena - it fights to the end, to death after the fight has not come out to escape or surrender loser carry feet first. There will be 22 games in which it is necessary to win a total of 27 opponents. After joining player is given a special set of armor Battle Raiment, which on every fight he has to wear. To start the fight should be reported Owyn the Blademaster its readiness. Once the player is ready - open the gates to the Red Room, room, bathed in the blood of the other gladiators, and through them the warrior rises to the Arena, to the delight of the crowd. 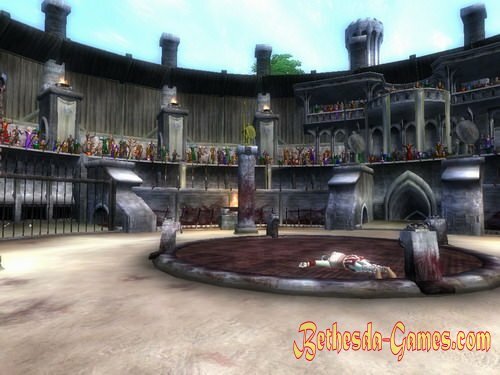 To start betting in the Arena, you should first talk to the Imperial City, with Hundolin the Gatekeeper, the gatekeeper of the Arena, usually during the day, 9am to 9pm with costs about the massive gates of the Arena. Prior to that, the door to the amphitheater (Gambler's Gallery) will be closed. Selecting and placing a bet of 25, 50 and 100 gold a player can go inside and see the fight. After the completion of the battle herald announcing the winner, if a player bets on the winning, it can receive a prize of $ 50, 100 and 200 gold at the pylorus. Experienced thieves can try your luck and try to crack the chest, which kept rates. Chest stands near the entrance to the building of the Arena, near the gatekeeper Hundolin the Gatekeeper. To join a faction Arena, you must talk to Owyn the Blademaster. It is located on the territory of Arena's Bloodworks, which in turn is located under the arena. Entrance to Arena's Bloodworks located with the opposition on the room side of the Gambler's Gallery and is a large hall. When a player reaches the rank of Champion, he will not be able to continue to fight in the Arena. Now he must call for the fight to win this Grand Champion of the Arena, "Gray Prince," the orc Agronak gro-Malog. 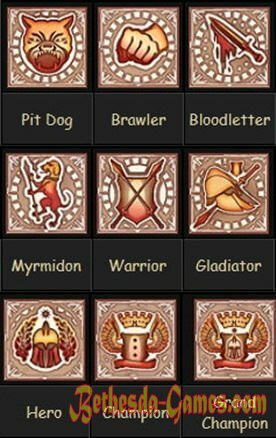 After receiving the rank of Grand Champion fights will issue once a week fighting Ysabel Andronicus, when a player can choose from three levels of difficulty. Award and the enemy depends on the level of the character.